Putnam County Sheriff Robert L. Langley Jr. invites the community to join their neighbors and local law enforcement officers for coffee and conversation. The mission of “Coffee with a Cop” is to break down the barriers between Police Officers and the citizens they serve by removing agendas and allowing opportunities to ask questions, voice concern and get to know the officers in your neighborhood. 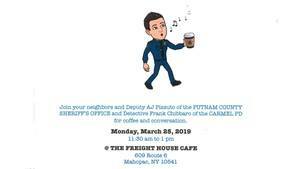 On Monday, March 25, 2019, between 11:30 a.m. and 1:00 p.m., you can join Deputy AJ Pizzuto of the Putnam County Sheriff’s Office and Detective Frank Chibbaro of the Carmel Police Department at “The Freight House Café” located at 609 Route 6 in Mahopac. On April 5, 2019, between 11:30 a.m. and 1:00 p.m., you can join Deputy Anthony Tolve of the Putnam County Sheriff’s Office at “The Pantry” located at 3091 Route 9 in Cold Spring.